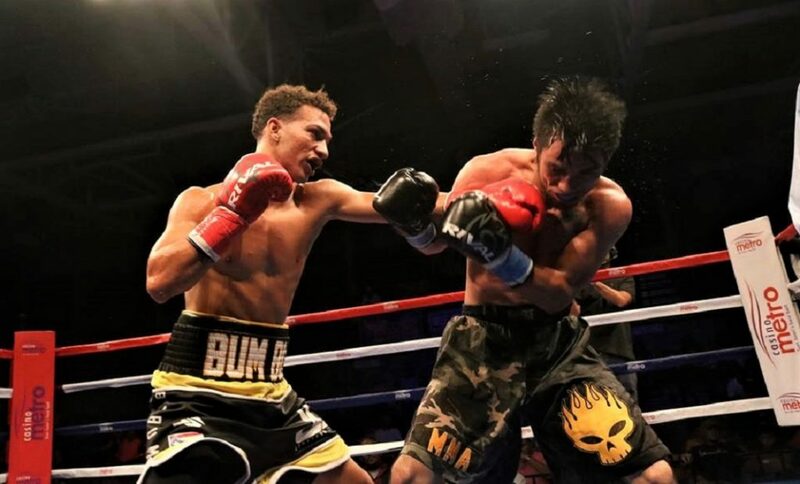 In October, the Puerto Rican boxing promotions ‘Fresh Productions Boxing’ was in the important series World Boxing Super Series,in which Puerto Rican boxers Emmanuel “Manny” Rodríguez (IBF World Bantamweight Champion) and Subriel Matías (WBSS Jr. welterweight replacement) scored big wins. Rodríguez successfully defended his world title by beating Australia’s Jason Moloney by split decision, and Matías scored a 1st-round TKO against Argentina’s Fernando David Saucedo. On Saturday, December 1st at the Pedro“Perucho” Cepeda ball park of Cataño, Fresh Productions Boxing will test the four remaining members of the so-called“Escuadra del TeRRoR/TeRRoR Squad”. After defeating former Olympian and favorite Jantony Ortiz by technical knockout in the fourth round, Abimael “Manos de Piedra” Ortiz (6-0-1, 4 KOs) will face Alexis Santiago (21-6-1, 8KOs) of Arizona, in a 10 round scheduled match at the Junior Featherweight Division (122lbs). Santiago quadruples Ortiz in experience.He is coming off a loss by way of decision against former world champion Juan Carlos Payano, of the Dominican Republic. “Abimael already has victories over Josean “El Tren” Figueroa and recently, he beat Jantony Ortiz. With that last victory, he showed that he is the best 122 pounder from Puerto Rico. With the test he has against Santiago, we understand that it will be of great help for his development, because it’s scheduled for 10 rounds and to that, you add that Santiago has great chin, good defense and throws many punches”, said promoter Juan Orengo. WBC FECARBOX Lightweight champion Alfredo “Ojo” Santiago (10-0, 3 KOs) of the Dominican Republic will make his first title defense against former world champion Jonathan Victor Barros (41-6-1, 22 KOs) of Argentina, in a 10-round duel. Barros has faced high-caliber boxers like Yuriorkis Gamboa, Micky Román (who he defeated), Celestino Caballero,Mikey García, Lee Selby, and Miguel Berchelt. “As we say out there, ‘Ojo’ is already proven. He is a warrior. He has great victories over the world title challenger Jayson Vélez, Mexican Olympian Arturo Santos Reyes and Argentine puncher Cristian Miño on his resumé. If everything goes well against Barros, the WBC will position him very well in the standings. This is a good fight for his second title defense”, said Orengo. Renowned boxer Jonathan “Bum Bum” López (4-0, 3 KOs) of Puerto Rico will face former WBA Interim World Champion and former world title challenger José “Torito” Rodríguez (32-7, 19 KOs) of Mexico in a six round bout in the bantamweight division. Rodríguez has faced well-known boxers such as Kazuto Ioka, Milan Melindo, Jerwin Ancajas and Aston Palicte. López had an outstanding amateur career (226-12) that includes a bronze medal in the World Boxing Youth Championships in Kiev, the Golden Belt in Ecuador, and was national champion of Puerto Rico for seven consecutive years. “‘Bum Bum’ is another great talent of the company that will give much to talk about. Not only did he have a great career in amateur boxing that includes a bronze medal in a youth world tournament, but he is currently very attached to professional boxing. The fight against ‘Torito’ will not be easy, but ‘Bum Bum’ has the skills and tools to get the victory and look great”, expressed Orengo. Lightweights: Steven Ruidiaz (2-0, 2KOs) of Canóvanas, will go up against Angel “Memito” López (6-1, 6 KOs) of Caguas in a 6-round contest. Flyweight: Oscar Marrero (4-1, 3 KO’s) from Luquillo will face Jesús “Chiquito” Soler (9-1-1, 5 KO’s) from Arecibo in an 8-round bout.